The Audi A3 is built on the platform of the Volkswagen Golf, so it’s only logic that all the technology from the Golf finds its way into the more expensive A3. Actually, the A3 has some more with the fast S3 model, but the Golf was leading in green technology, thanks to its BlueMotion version. Not anymore. Here’s the Audi A3 TDI ultra. It doesn’t sound much original, but the greenest Audi models will now have that name: ultra. 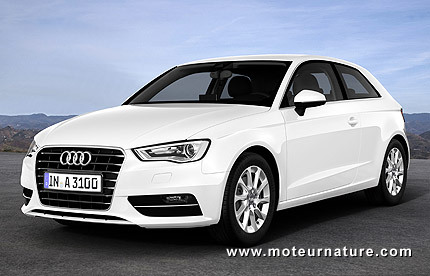 This diesel A3 is the first, but there will be others, and some gasoline models will carry the label too. This A3 TDI ultra is 15 mm lower than the standard model for a smaller frontal area, and it’s fitted with 205/55 R16 low resistance tires. Under the hood, gears have been lengthened a bit, and the engine has been carefully optimized for very low fuel consumption. On the the lenient European average cycle, the Audi A3 TDI ultra got an incredible 73.5 mpg rating. Impressive result for a luxury and comfortable compact.